Rousseff defends World Cup spending Jump to media player Brazilian President Dilma Rousseff has defended the country's spending on the football World Cup, which starts on Thursday. Is Brazil pushing a cliched image? Jump to media player Some are complaining that the organisers of the World Cup are promoting a cliched image of Brazil. 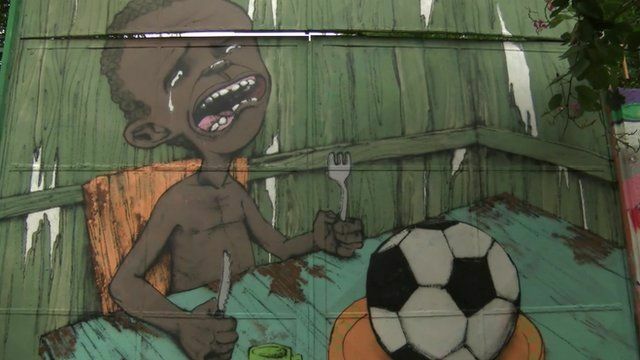 In Brazil, street artists are using graffiti to protest against the money being spent to host the World Cup. Several strikes and protests have already taken place across the country against perceived excessive spending. Pictures of the evocative murals have been creating an internet sensation. Jon Sopel went to meet one of the artists.